SPINELESS SFA chiefs will take NO action over the Tynecastle mayhem which shamed Scottish football on Sunday. A TV audience watched in disbelief as Celtic keeper Rab Douglas was struck on the head by a coin and Hearts goalie Craig Gordon was gobbed on. But the beaks will ignore both incidents because they haven’t been mentioned in ref Kenny Clark’s match report ? despite SFA chief David Taylor demanding tougher action to stamp out yob fans in football. SFA disciplinary chief Drew Herbertson said: “We have received the misconduct report and there was no mention of the coin-throwing incident. All that was mentioned in the report were the cautions incurred during the game so there will be no action by the SFA. One Celtic fan has already owned up to the club and had his season ticket suspended indefinitely following the disgusting attack ? but Herbertson insists that is a matter between the club and their supporter. He said: “That matter was not the subject of a report here and clubs are responsible for their own supporters. They will no doubt be keen to avoid things like this happening. 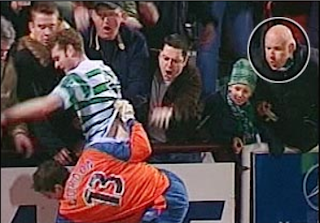 A Celtic official said: “While we utterly condemn the behaviour of this supporter, we appreciate the honesty he has shown in making contact with the club to apologise. With the Scottish Cup return between the two clubs at Tynecastle looming on February 7 players union secretary Fraser Wishart has admitted he fears for his players ? and Hearts ? if there is any repeat. He joined calls for fairminded fans to shop the yobs and pointed out: “They are running the risk of forcing the club behind closed doors and you can imagine the financial implications of that. “You have to ask fair- minded fans to identify the culprits. As a Motherwell player Wishart saw team-mate John Philliben smacked by a coin during a game against Rangers. Then when he switched to Ibrox he was on the bench when keeper Ally Maxwell was attacked by a fan at Parkhead. He knows the dangers when the yobs are at work and said: “The re-emergence of coin-throwing is very worrying. “You only have to look at the damage caused to Hugh Dallas when he was hit on the BACK of the head. “If it hits a player in the eye you are threatening his entire career. “I have to say that players take a lot of criticism but you have to look at how Rab Douglas handled that whole incident.